Being confident is extremely important when running a business. And comparing isn’t helpful – unless it inspires you to take action and make change. When you want to attract your dreamie clients, you may find you spend more time noticing what other business owners do. Whether you’re trying out new marketing strategies and methods, new ways of doing things, it’s easy to get sucked into doing what everyone else is doing. 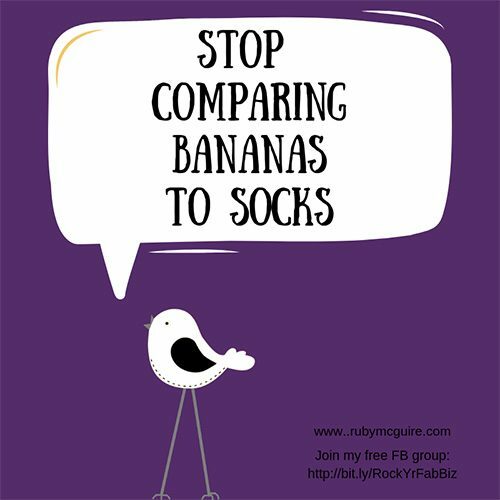 Stop Comparing Bananas to Socks! You may find you’re doing what I call ‘comparing bananas to socks’. What I mean is that you’re not comparing things that are same or equal. For example, you may be comparing yourself with someone who has been in business longer than you, or who might have a very different background, life journey etc. This is not a fair or equal comparison. So, instead of comparing bananas to socks, below I share 5 tips to help you “mind your own (coaching) business” and also a 4 step process for when you notice you’re in the comparison trap. First, 5 Top Tips to Help You Mind Your Own (Coaching) Business! Gather lots of information from different places, but don’t copy them. Learn and aim to do things differently, your way. This way you differentiate yourself from others and stand out from the crowd – it’s noisy out there! Running your business your way is a much better strategy than checking out what everyone else is doing and comparing yourself against them. We all know it’s not healthy to ‘should’ on ourselves! So, be sure to do things you enjoy – and not just the things you think you ‘should’ be doing. For example, if being on Twitter sends you over the edge then don’t spend time there; instead find another social media platform that you do enjoy. Or if you hate writing blogposts don’t write them! Do a podcast, YouTube video or Facebook Live or something else that you do enjoy. Caveat – make sure you’re putting your effort s where your potential dreamie clients will hang out too. To be successful in business, you need to work on your mindset as much as the business side of things. There will be challenges that come your way, obstacles to overcome and it’s important to build a solid level of confidence to support you. Question: How do you feel when you check out what everyone else is doing? Does it send you into a downward spiral of not being good enough, smart enough, far ahead enough? If so, don’t let it! And make an effort to build your confidence so that you stand your ground. Knee jerk reactions aren’t great when you’re running a business; you need focus, direction and a plan! If you keep changing in different directions you’ll waste loads of time, energy and possibly even money. Set a plan and follow it through. Don’t get distracted. You might be telling yourself, “So and so is doing a brand new programme”, “They’re doing Facebook ads”, “Someone else is trying out a super duper new way of doing something in their business!” and it can throw you off balance. You start to think that you ‘should’ be doing that – or your business won’t be successful. But first, you need to question if it’s right for you and your business. What works for one person doesn’t necessarily work for someone else. And it’s so easy to get sucked into running your own business as a ‘race’. Instead, what would your days be like if you just took consistent, focused action and enjoyed the journey? As it said in that famous song by Baz Luhrmann in 1999 (based on a 1997 advice column) Everybody’s Free To Wear Sunscreen, “Sometimes you’ll be ahead, sometimes you’ll be behind”, and that’s ok.
Stop. Ask yourself whether this comparison is helpful and constructive. It may be that it’s useful, it might be a good motivator for you. But if it’s de-motivating, STOP! Remind yourself it’s a snapshot. Remember, you’re only seeing a snapshot of this other person’s life, and it’s quite likely they’ll have their own insecurities too. Despite what we think, nobody is perfect, and 9/10 people don’t have the perfect life we perceive them to have. Be kind to yourself. Everybody is different, and comparing is natural. Don’t use it as yet another tool to berate yourself with, instead think of something kind to say to yourself. Use it to inspire you into action and make changes. Often when we compare ourselves to someone else it can be a great tool to help us know what it is we desire/strive for. For example, perhaps that person runs a successful business, it could be they have the husband/wife, the car, the lifestyle, the look you wish for yourself. If so, recognise what you really want in life, and then set goals to make it happen for you! What if this year you simplified everything? What if you stopped comparing, set a simple plan and stuck to it? How much more confident could you be? Your call to action: Notice when you’re comparing yourself to others, and are about to deviate from your plan. You do have a plan, don’t you?! If not, make that your first action. Use the 4 Step Process when you notice you’re comparing, and start to believe that what you’re doing is perfect for you. Finally, ‘mind your own business’ instead of everyone else’s (I mean this in the nicest possible way of course!). Remember: Stop Comparing Bananas to Socks! If you like this, then you’ll love Ruby’s Rock Your Visibility Programme which is specifically designed to give you that boost of self-belief and skills to overcome all the challenging mindset monkeys that are holding you back. No more being worried about what people will think about your content and posts. Lose that feeling you’re being judged and let go of the need to compare yourself to others in your field – because ROCK YOUR VISIBILITY puts the tools in your hands to simply be yourself on social media. Contributing Author: Ruby McGuire, Visibility Diva, aka Queen of Connection, is a mum, wife, cappuccino lover and introvert. She helps unseen solopreneurs step up and shine on/offline so they can make money doing what they love. 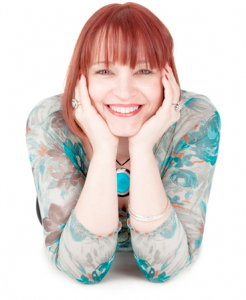 She’s an Accredited Senior Coach, Author of Ruby’s Visibility Tips, a Trainer, NLP Practitioner & Coach, an EFT Practitioner, writes for International Coaching News & various online articles. Get more Ruby with her podcast show on iTunes: Rock Your Fabulous Biz. You can also find Ruby at her pretty online home or here on Facebook. Failing that she may be satisfying her obsession of pinning on Pinterest!